We approach all engagements holistically to assure a balance among people, process, and technology. Each PowerHouse engagement is uniquely structured. We employ no forced methodologies or canned reports. Our approach aligns with the latest trends in multi-media, Web-enabled, and blended Call Centers. We are efficient. PowerHouse has created and fine-tuned a set of internal “no-fluff” tools that can be customized to capture data based on unique client needs. We use a combination of techniques – system research and analysis, onsite interviews, focus groups, call observations, design sessions, checklists, and inventory sheets. 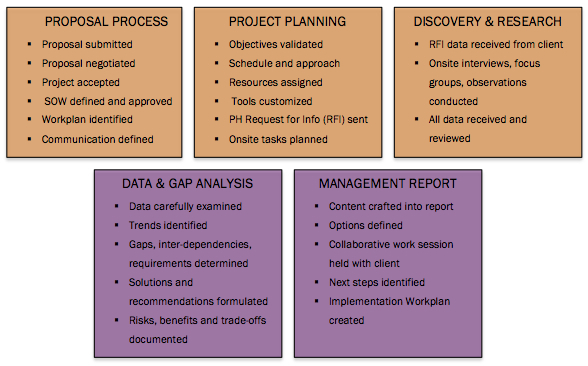 Project standards and a template-ized approach to data gathering and reporting save us valuable time. We gain efficiency for ourselves and our clients. Communication is important to us. PowerHouse maintains close collaboration with the client team throughout our projects. Each step of the consulting process includes meetings and discussions to review status on activities, results, and actions.